“Quiet times”. For some, the term may be fluffy and unintelligible Christianeze. Or perhaps it provokes a pang of guilt for a neglected New Year resolution. For others, though, quiet time is a helpful and even crucial part of their day. For myself, neither regular study nor teaching can substitute my need for open-hearted prayer and Bible reading. Resources like Bible reading plans or the infamous “devotional” can provide helpful guidance or freshness. However, devotionals are often less interested in leading the reader to the rich springs of Scripture and more with jolting them with a sugary soda rush with which to start the day. What if a devotional were concerned with increasing Biblical literacy? 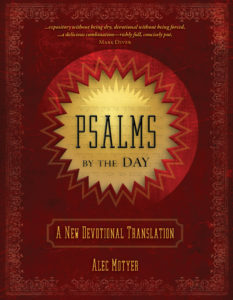 Psalms by the Day: A New Devotional Translation by seasoned scholar Alec Motyer fills this very gap. This is a “devotional translation” that draws from Motyer’s fruitful career of scholarship in service of the church. Psalms by the Day is made up of several elements. 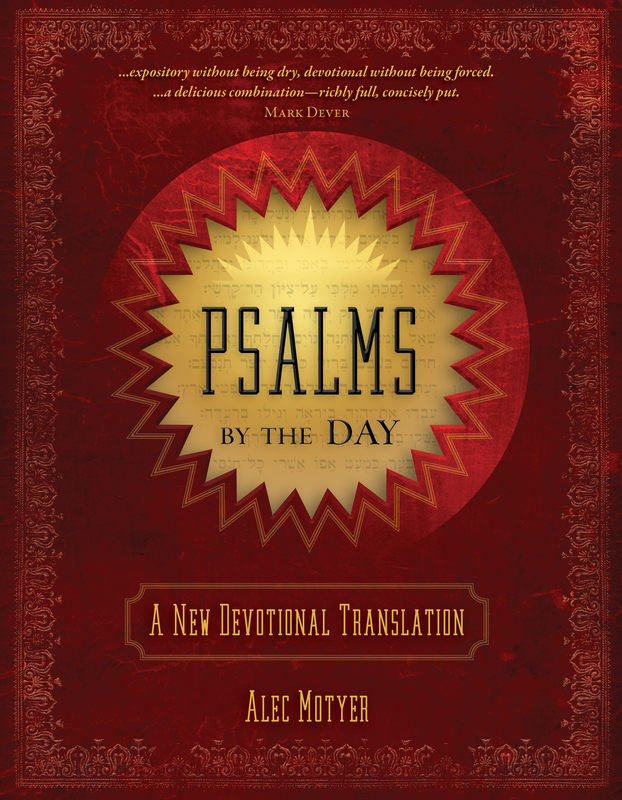 First and foremost is the author’s own fresh translation of all 150 Psalms. This is the bulk of the book. Perhaps surprising for a “devotional translation”, Motyer mixes readability with an attempt to bring the reader “as near as [one] can to the Hebrew of the original” (p9) by following word order of the Hebrew when it indicates emphasis. The result is a fresh and readable, though sometimes awkward, translation. This may seem like a recipe for disaster, but anyone familiar with different Bible translations will have no trouble here. The translations are arranged into units with summary headings. Though not explained in detail, each unit heading is preceded by a letter that Motyer uses to indicate chiastic, or parallel, arrangement. Along with the translation are copious notes presented on the outer margin. These are similar to study Bible notes, though more numerous and extensive. The notes either develop a concept, explain the nuance of a Hebrew word, or point to related OT texts. Though all 150 Psalms are present in the book, they are collected (or divided, in the case of Ps 119) into 73 “Days” to suggest a digestible daily reading. At the end of each “Day”, Motyer offers some concluding devotional thoughts, entitled “Pause for Thought”. These are written in a personal tone and reflect on the Psalms just read. I found these to be excellent especially as they are truly driven from the text, not the opposite – sadly common in devotionals – where the writer proof-texts their own ideas. As example, Day 1 consists of Psalms 1-2. The translation is easy to read, though notice the odd phrasing in verse 1: “nor, according to the way of sinners, to take his stand”. This allows the reader to get closer to the Hebrew word order and emphasis. 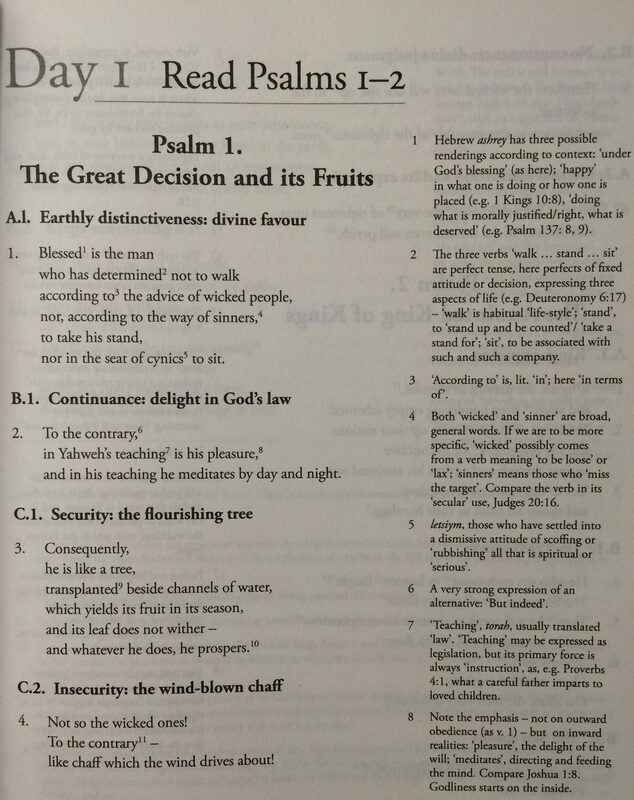 Motyer views Psalm 1 as a chiasm, where verses 1 and 6 are parallel, as are 2 and 5, and 3 and 4. For this Psalm, there are 16 notes, which is about average. Notes include an explanation of “blessed” and “teaching/torah”, as well as the “walk, stand, sit” progression in verse 1. After Psalm 2, Motyer’s Pause for Thought notes the “blessed” inclusio that ties the Psalms together, the fact that the blessing comes through heeding God’s word, and the fulfillment of Psalm 2 in Christ. Though all Pause for Thought insights are related to the text, this one is more technical than average. Another feature of Psalms by the Day is the binding. It is a nice sturdy hardcover book with a welcome tassel for marking one’s place. Christian Focus have really put thought into the presentation, resulting in a book more worthy to be preserved and treasured. Perhaps you want to read the Psalms with fresh eyes. Perhaps you want some help getting back into regular and structured Scripture reading. Whatever the motivation, I can highly recommend Psalms by the Day (and am sure Motyer’s popular Isaiah by the Day is equally excellent). Oh, that all devotionals were so concerned with presenting the reader with a fresh reading of Scripture! Many thanks to Christian Focus for providing a copy in exchange for a balanced review.